Is This It? – Love. Life. Practice. It wasn’t especially a positive comment, but it stuck in my head, especially as the woman she was talking to seemed to agree with her. I’ve been reflecting on the very different ways the phrase “Is this it?” could be taken. For them, I believe, “it” applied to the steady state of their lives. For me, though, that’s been something I’ve been searching for – a steady state. “It”, for me, is a state of mind where I feel at home, where I feel that I can relax into my own body, my own sense of self, my own values, and feel like I belong. 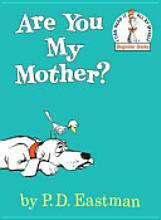 …much in the way the little bird went around asking “Are you my mother?” in the classic Dr. Seuss book. Once I find a place that seems a likely home, though, the emphasis in the question changes yet again. I’ve found an instance of this, now the question is, does it fit the image of it that I have in my mind? What is it? I outlined my particular it above, and while it may seem trite and simplistic, I gotta tell you, I have sacrificed more than I care to share in order to arrive at just that realization. And the realization that I’d rather die looking for it than having settled for less than it. But the fact is, my it is not everyone’s. If it were, the world would be a much simpler, if less beautifully complex, place. Think about it: what does that mean to you? If you’re not sure, how will you find it? Look around you, as the woman did: “Is this it?” I can’t answer for her, nor can I for you, and maybe it’s not worth contemplating, because if it‘s not…then what are you going to do? Let’s leave that alone. Instead, let’s assume that you have decided that your particular this is it. One of those little mice – who is both blender and volume-knob resistant – has the job to keep popping up and putting the final emphasis on the question: Is this it? Really, day in, day out – sure, you said this was it, but is it? It’s a pesky mouse. If you’re lucky, I believe, you simply say “Yup!” and turn the volume knob down. Or to frappÃ©, depending on your metaphor of preference. Like most things I write about in this blog, I’m not saying any of this is easy. The whole issue of it can cause sleepless knights, irritable vowel syndrome, and fearing loss. It’s taken me literally across the U.S. with occasional forays into Europe, and I’m still not sure that it isn’t actually in Berlin. But for now, I’m trying the this in Seattle. It seems to be going pretty well so far. How’s it goin’ with you? This is it. Voila, enlightenment.